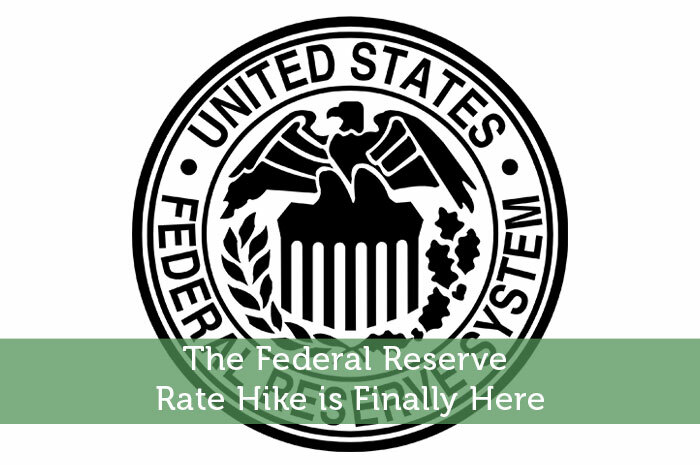 On Wednesday, December 16th the Federal Reserve met and decided to increase the key rate by a quarter point. This was widely expected to happen. 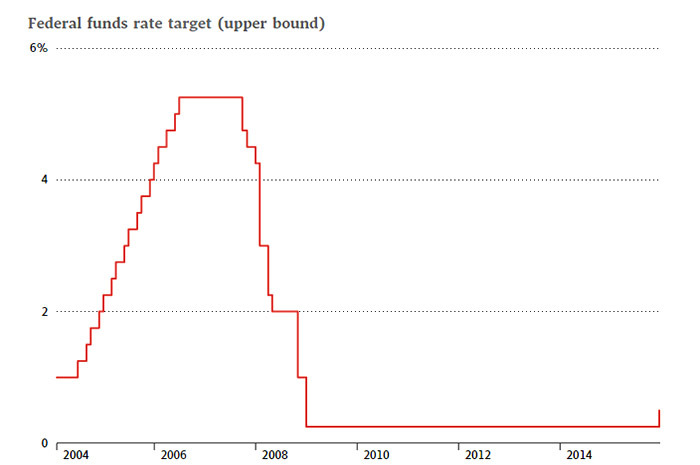 After 7 years of effectively zero percent interest rates the U.S. central bank finally made a move on the interest rate. Janet Yellen, the Fed Chair, explained the open market committee’s decision for the rate hike with a statement that include the following key paragraph. The key take away from this language is that that the fed believes the U.S. economy is stable enough, both in terms of employment and inflation, for it to be confident enough to begin normalizing monetary policy after years of policy easing. But the Fed also stressed that the process of raising rates will be slow. “The committee expects that economic conditions will evolve in a manner that will warrant only gradual increase in the federal funds rate. The federal funds rate is likely to remain, for some time, below levels that are expected to prevail in the longer run,”explains Yellen. Below is a historical chart of the Federal funds rate since 2004. New projections show analysts are expecting the fed-funds rate to creep up to roughly 1.38% by the end of 2016, according to the median projection of 17 officials. Then it will gradually rise to 2.38% by the end of 2017 and 3.3% in three years, which is closer to the historical average. That implies one whole percentage rate increases next year. Whether or not the interest rate will actually follow suit depends depends on whether the Fed’s forecasts for the economy will hold up. Raising rates could hit your pocket as soon as the next billing cycle. It’s been nearly a decade since the Fed raised interest rates so it’s easy to forget what happens to our personal finances when that happens. Even though today’s quarter rate hike seems insignificant the important thing to remember is how this event could trigger a pattern of more raises in the future. Now would be a good time to take a look at your finances. This quarter point change is going to have a ripple affect on most bank loans, credit card, variable rate mortgages, and and investments that you have. The basic take-away is that the rate hike will benefit savers and conservative investors, but will hurt borrowers. People who have been saving have seen abysmal return for years and that’s going to change. Savings accounts, CDs, and money market accounts may not see higher returns right away but it’s a turning point for savers so that’s a good thing. On the other hand, if you have credit cards or loans with variable rates then you’re going to feel it in a bad way as soon as your next statement comes out. According to the Consumer Financial Protection Bureau, over the first half of 2015, more than 94 percent of general purpose accounts in the credit card database have variable APRs, with an average interest rate of 12%. This means your debt will cost you more than it did than last month. A small 0.25% Fed hike will cost consumers overall $1 billion annually. A larger 1% rate hike will cost consumers about $6 billion annually. Maybe the best thing to do for people with consumer debt is to pay off their loans. But if that’s the case then the consumer driven economy may slow down. Raising the interest rate may be bullish for the U.S. dollar but it’s not necessarily a positive move for the U.S. economy as a whole. The Fed’s action this week is expected to be the first of more rate increases that will probably come over the next 12 months.